Galaxies and dark matter go hand in hand; you typically don't find one without the other. So when researchers uncovered a galaxy, known as NGC1052-DF2, that is almost completely devoid of the stuff, they were shocked. 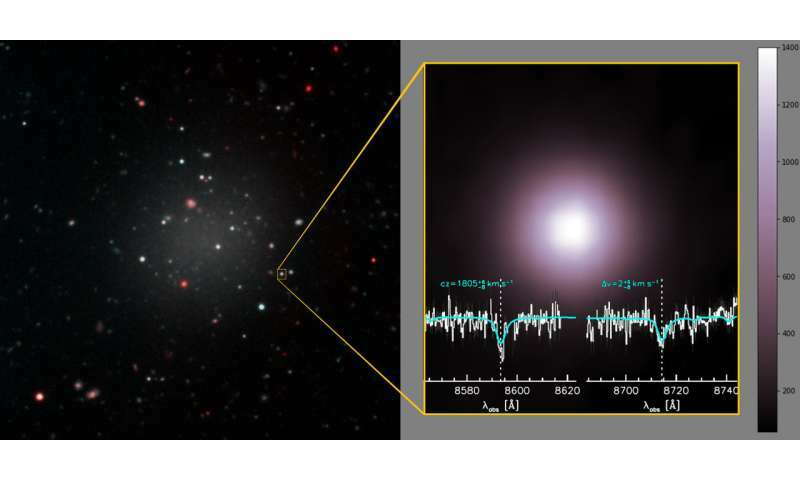 "Finding a galaxy without dark matter is unexpected because this invisible, mysterious substance is the most dominant aspect of any galaxy," said lead author Pieter van Dokkum of Yale University. "For decades, we thought that galaxies start their lives as blobs of dark matter. After that everything else happens: gas falls into the dark matter halos, the gas turns into stars, they slowly build up, then you end up with galaxies like the Milky Way. NGC1052-DF2 challenges the standard ideas of how we think galaxies form." The research, published in the March 29th issue of the journal Nature, amassed data from the Gemini North and W. M. Keck Observatories, both on Maunakea, Hawai'i, the Hubble Space Telescope, and other telescopes around the world. "NGC1052-DF2 is an oddity, even among this unusual class of galaxy," said Shany Danieli, a Yale University graduate student on the team. "Without the Gemini images dissecting the galaxy's morphology we would have lacked context for the rest of the data," said Danieli. "Also, Gemini's confirmation that NGC1052-DF2 is not currently interacting with another galaxy will help us answer questions about the conditions surrounding its birth." Van Dokkum and his team first spotted NGC1052-DF2 with the Dragonfly Telephoto Array, a custom-built telescope in New Mexico that they designed to find these ghostly galaxies. NGC1052-DF2 stood out in stark contrast when comparisons were made between images from the Dragonfly Telephoto Array and the Sloan Digital Sky Survey (SDSS). The Dragonfly images show a faint "blob-like" object, while SDSS data reveal a collection of relatively bright point-like sources. In addition to the Gemini observations, to further assess this inconsistency the team dissected the light from several of the bright sources within NGC1052-DF2 using Keck's Deep Imaging Multi-Object Spectrograph (DEIMOS) and Low-Resolution Imaging Spectrometer (LRIS), identifying 10 globular clusters. These clusters are large compact groups of stars that orbit the galactic core. The spectral data obtained on the Keck telescopes revealed that the globular clusters were moving much slower than expected. The slower the objects in a system move, the less mass there is in that system. The team's calculations show that all of the mass in the galaxy could be attributed to the mass of the stars, which means there is almost no dark matter in NGC1052-DF2. "If there is any dark matter at all, it's very little," van Dokkum explained. "The stars in the galaxy can account for all of the mass, and there doesn't seem to be any room for dark matter." "Keck is in a very small group of telescopes that could even attempt these observations, because you need a large telescope to measure these accurate velocities," van Dokkum added. "Keck also has some of the best spectrographs in the world for measuring the velocities of faint objects. We had the opportunity to check and make sure we got the same result within the uncertainties, and that gave us confidence that we were doing things right." The team's results demonstrate that dark matter is separable from galaxies. "This discovery shows that dark matter is real - it has its own separate existence apart from other components of galaxies," said van Dokkum. 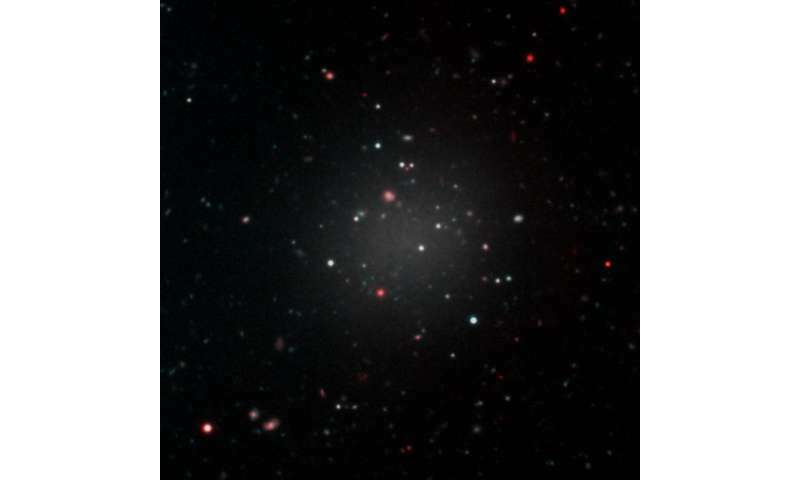 NGC1052-DF2's globular clusters and atypical structure has perplexed astronomers aiming to determine the conditions this galaxy formed under. However, researchers do have some ideas. NGC1052-DF2 resides about 65 million light years away in a collection of galaxies that is dominated by the giant elliptical galaxy NGC 1052. Galaxy formation is turbulent and violent, and van Dokkum suggests that the growth of the fledgling massive galaxy billions of years ago perhaps played a role in NGC1052-DF2's dark-matter deficiency. These possibilities are speculative, however, and don't explain all of the characteristics of the observed galaxy, the researchers add. Any time you grade on a curve? Sheer cosmic petulance will result in weird outliers at both ends of the scale. Hey, at least your not being bored with universal uniformity! It seems obvious to me...intense gravity travels through time allowing it to affect two or more places at once in our space-time. No dark matter, just normal matter multiplied. Wait, they said they found there could not be any dark matter in this one, so that "shows that dark matter is real"? Because it is separable? That is begging the question. Or affirming the consequent. One of those logical fallacies. It is only proven to be separable if you presuppose that it must exist and is therefore expected to be there, so that its absence can be taken as evidence of a deviation from the norm. Wait, they said they found there could not be any dark matter in this one, so that "shows that dark matter is real"? Because it is separable? It's remarkable that a failure of theory is claimed as evidence to confirm said theory. Maybe it's just darker matter. We can't find any, that is the greatest evidence of its' existence, only a pop-sci culture neophyte could string words together in such a clever fashion. OK, now let's get some more pop-sci culture neophytes on board here to explain why Shany was so dead on accurate. Schneibo? Jonesy? RNP? Did nature pull out the paper. I couldn't find it from the reference. I think I'd rather approach the article from a different angle. We have an effect in (apparently) most galaxies that seems to act in such a way so as to suggest there is 'mass' that we are unable to detect...at present. It doesn't really matter (pun intended) what it is called. The article claims that in this instance that effect is absent. I wonder if this just as much of a problem to those alternative theories that have a different explanation for 'the effect' because they too may have to explain the absence. I am not posing arguments here one way or the other but perhaps a more general view looking at both sides. Interesting, I think. You have got that back-to-front because it would appear to prove you wrong since if you where right then it shouldn't be possible to find this example of a galaxy that seems to have gravity that does NOT get "more strong as it travels". In fact, this latest finding can be viewed as circumstantial evidence for dark matter as it rules out a few albeit not all of the alternatives. You have misread the article. It was not Shany that made the relevant comment. It was Prof. Pieter van Dokkum, who is a highly regarded researcher with twenty years of publication history and is currently a professor at Yale He is certainly no "neophyte". As to why he says this, consider, the article says: "The team's results demonstrate that dark matter is separable from galaxies." In other words, if confirmed, it would preclude MOND and similar models as an explanation for the dark matter effect. It is perfectly logical that science so much wanders through dark places and there it sees everything dark that science is incomprehensible. Why does science go without results? Because it does not know these phenomena: the structure of the universe, how and from what the matter arises, what gravity and magnetism are and who causes them, do not know the laws of the movement of celestial bodies, use various illogical theories such as the expansion of the universe, the complexity of time, the existence of gravitational waves, dark matter, energy and similar nebuloses. Scientists are investigating some phenomena of hundreds of millions of light years away from us and there on a telescope (several decimetres of square) that see the galaxy as a grain of bread and it is up to several million light years old. And the closest celestial object to our planet, the moon, nobody found out why he always has one side facing the Earth? How much darkmatter is between your nose and the computer screen as you inkly type. If so, how is it there is no darkmatter in NGC1052-DF2 a common ultra-diffuse galaxy that is the size of our Milkyway devoid of all darkmatter! This implies that space has clouds of matter and clouds of darkmatter which if they meet they can mix. But if the do not meet you get clouds of pure undiluted of matter forming galaxies, and clouds of pure undiluted darkmatter forming galaxies, and you get clouds of a mixture of darkmatter and matter forming galaxies. mackita> The fact that (amount of) dark matter (DM) is separable from (amount of) visible matter . It is the basis of the knowledge of the motion of celestial bodies. Or Einstein's "proof" of why the Mercury planet has such uneven movement? This evidence is the cause of scientific ignorance, such as Doppler effect and Lorenz's transformation. @ mackita, often mentioning some "dense aether" model, but never wants to explain what this ETER (aether) is. If you do not know the role of the real AETHER, which fills an infinite universe, then you will never find out the cause of anything in the universe. milnic> It is the basis of the knowledge of the motion of celestial bodies. Or Einstein's "proof" of why the Mercury planet has such uneven movement? This evidence is the cause of scientific ignorance, such as Doppler effect and Lorenz's transformation. The comment "Clouds of pure untainted darkmatter" says it all, we're in a vacuum devoid of matter with darkmatter clouds, matter clouds, darkmatter + matter clouds. My english is not my first language but here is what i think it is a possiblity logic theory. First it is a canadian study of the galaxy to wait for other studies or more discoveries from other cointries. On the topic of dark matter which scientists cannot see or detect by machines they have failed till now to detect it by detector machines. The logic it is there because it is what keeps the planets,stars, objects in universe holding it all together as a glue. And it is what creates planets stars ect. Why cant we think that perhaps we cannot detect dark matter because we have not broke the limited dimensional viewing of the universe in other words there are parellel universes another dimensions we cannot detect due to limited primitive machines that cannot let us view beyond our restricted dimensions. Also another observations scientists believe in dark matter when they cannot detect it on machines it is not seen or touched that is like to say the same about GOD we cannot see the elohim or detect it. So why it is not possible.to say a real god which is not fiction. Which might be a possiblity of logic. If they discovered a galaxy without dark matter are we sure what is dark matter because we cannot even detect it on machines. What there can be other substances other than dark matter that can hold stars planets on galaxies. It could be very strong gravity or something else. And what makes us shocked a galaxy without dark matter AND so. The law of the universe should be identical on all galaxies? , i believe it is not, our eyes are shadowed by darkness and the limitations of our machines. Lets say we are a computer plant planet in a dark room we cannot see other objects so we invent machines with the same kind of thinking and it would be same results. Nothing . What we cannot see is the other dimensions,the parellel universes to us we are in shadows. We say clouds dark clouds surrounding our bubble galaxy and if we decode and see in a new lens the dimensions breakthroughs we could travel from one universe to another , thats where the source of creation or GOD or elohim. I think far more likely the CDM model is not correct. Recent developments indicate that we may have it wrong with the 'missing matter'. It more likely the work of Hannes Alfven can explain things. Rguy, knock it off trying to share your FAITH on a SCIENCE site, we're not interested in your rationale for believing in stuff not proven to exist. This Galaxy is clearly missing its black hole in the centre so could this be evidence of Stephen Hawkings evaporation of a black hole ? This doesn't necessarily rule out theories like mind because this particular galaxy could simply be structured in a way that both models give the same answer. You can't just rule out models without checking first. They should compare dark matter quantities to galaxy structure to see if any connections can be found. Dark matter is likely to be at least partially due to overlooking/miscalculating some effect at these large scales. Soooo...it's still 90 orders of magnitude longer than the unverse has existed till that happens. Even pretty small primordial small black holes currently collect more energy from the cosmic microwave background than they would give off due to Hawking radiation (read: they're growing, not getting smaller). And with this statement you confirm that you really have no idea about the movement of the celestial bodies and their paths. I deliberately took for example our month to check whether any of the scientists can explain: WHY OUR MOON HAS, ALWAYS, THE SAME HIS FACE, TURNS TO EARTH? If you do not know it, then everything you talk about is nebulous, as is Einstein's "proof" of the perimeter of Mercury. Do not show how much you do not know the basic laws of nature !! Does it really? I thought MOND-like theories were about differences at large scales, speeds, and maybe densities. This is a diffuse galaxy. Enough mass and distance, but not enough density. So maybe they don't have to explain away the lack of apparent extra mass because they would not have to predict its presence in the first place. Instead of absence of dark matter is gravity bleeding off into other dimensions more than that of other space? That is if bleeding of into other dimensions accounts for the weakness of gravity. It seems the science of darkmatter has its roots in English Christianity. Some of the great scientist were all deeply steeped in English Christianity Isaac Newton lived his life with in the walls of the greatest English Christian religious institute the world has ever known, Henry the VIII was one of its very famous benefactors. Cambridge University, as you walk down kings parade past St John's college down trinity street there is no other town like Cambridge as out of Cambridge came the laws of gravity which are now applied equally to matter and darkmatter alike. And why is it ultra-diffuse? Because it is missing the central core star. Instead, it contains a number of intermediate cores within the rather luminous globular clusters, that themselves are responsible for seeding the galaxy with star-forming material. However, these less massive cores themselves eject far less total new matter in a more widespread fashion, leading to the utra-diffusion condition. Since dark matter is simply an optical effect related to local matter density (think galactic halos), the diffuse nature of this galaxy would appear to contain no dark matter at this distance. Tux, you might want to reconsider your assertion that Newton's involvement with a semi-secret cult of aristo bible-code scholars as christian. It would be more accurate to describe their efforts at deciphering bible code and astrology as a christian variation of kabbalism. A blue-blooded subset of church of england adherents. With a bent towards classical philosophy. What we would describe today as garage scientific engineering. Neither you nor the rest of us would be considered 'noble' enough to associate with them. Most of the findings and writings of that clique, are ignored today as irrelevant. Except to historians specializing in the philosophical origins of modern science and engineering. It was the brilliant skeptic, Émilie du Châtelet, who corrected Newton's errors of math & latin. She popularized the genius of his work. Her efforts to explain the relevancy of Newton's Principles into common language, made his theories known to the rest of humanity. When the companion star exploded as a supernova, the tremendous release of energy flung J01020100-7122208 into space at its high speed. The star is the first runaway yellow supergiant star ever discovered, and only the second evolved runaway star to be found in another galaxy. This is one example of how this ultra-diffuse growing process can begin, as the ejected supergiant continues to grow from within, becoming more active and unstable to eject more newly formed matter until it forms a galactic cluster itself. So it is fallacious to assert that there is simply no explanation for such diffuse galaxies. Merger maniacs have constructed a tree of conclusions based on limited initial conditions. If the assumed initial conditions are wrong, then the whole construct is a wasted effort. That is where the merger manic has gone wrong, and cannot then ever emerge from the rabbit hole. Too embarrassing. Lol when will they learn, its the dark matter coupled with time that gives mass to every particle in this universe and dark matter resides in the time domain which also has 3 spatials dimensions just like our own. There is no higgs boson. NGC1052-DF2 is 65million Iys 1/200 the luminosity of our milky way. Our milky way deeply immersed in darkmatter astronomers down on planet Earth pushed their telescopes through this thick fog of darkmatter and peered darkly through this invasive darkmatter fog for 65million Lys to an almost invisible galaxy, I'm just wondering did the fog of darkmatter clear to such an extent NGC1052-DF2 suddenly became clear like a ship at sea emerging out the fog. Wow. I only give a handful of 1's a year...but you truly earned that one with that load of BS. Never mind science will catch up. I'm wondering why you didn't make that comment on the relevant thread last year...certainly would been better there than here...my comments are there too. Save your breath and don't bother with savvys84. Just a thought, that's all. My sincere apologies, I intended to give you a high score but gave you a low score by mistake for the above comment. So it would have read 5/5 (6) and not 4.3 (6). Once again, dark matter is in the time dimension and the charge does not carry into ours. I dunno if you got the memo. Time is not a separate dimension. It's called spacetime for a reason (not "space and time") - and there are plenty experiments to prove it. Have been for roughly 100 years. Didn't H.G. Wells write about that too, Ha! Sorry antialias_physorg I just couldn't resist that one. Somehow I'm not convinced that a link to any of that will be forthcoming. @Mimath, is that from "The Invisible Man" or "The Time Machine?" @anti, I would have to say that time is, indeed, a separate dimension, speaking in rigorous mathematical terms. So are X, Y, and Z. While spacetime is indeed a thing, that doesn't imply that the dimensions that make it up aren't. Certainly not in relativity. What is true is that the dimensions can be transformed into one another by observers in different states of motion, without any intrinsic change in the physical situation; however that also doesn't make the dimensions one single thing with no difference between them. Which is the point I was trying to make. You can't just take dimensions and say they're separate from one another. because if they were then a change in one would never affect another. But with Lorentz transformations in Relativity we know that's not true. however that also doesn't make the dimensions one single thing with no difference between them. I think we're into semantics here, but I think when we're talking about three dimensions that are interrelated circularly and one that's related to them all hyperbolically, it's necessary to be extremely careful what we say. You said, "Time is not a separate dimension," and that's technically incorrect. It is a separate dimension, but it's one that's transformable (and I would argue that also means they're interchangeable) into the other three and vice versa. Following this line, then, I would say that it would be better to say that @savvy was claiming they're not interchangeable, and I'd agree with you that's also incorrect. That they're interchangeable (and in particular time is interchangeable with the three space dimensions) means they're all "the same kind of thing" and therefore it's incorrect to try to claim that time is somehow intrinsically different in anything but its relation to the space dimensions. "Time is not a separate dimension,"
Well maybe I should have said "not fully separate". It's distinct, but it's interrelated with the rest of them. The implication is always that when we call something a "dimension" we mean something that is orthogonal to all the other dimensions we defined. In Newtonian physics space and time work that way. In Relativity they don't. And that's why i think it's really important to make a distinction between "space and time" and "spacetime". Space isn't time. But they're not fully seperable either. I would disagree that time is not orthogonal to the spatial dimensions under relativity. In fact I would argue that time is a dimension, just as the three spatial dimensions are, and that the definition of a "dimension" is a direction orthogonal to all other dimensions. We just can't look in that direction because of our limitations. But we can see it being transformed to and from the others, albeit with different math because it's not circularly but hyperbolically related to them. You should probably glance back over the later chapters of Einstein's "Relativity" where he talks about Euclidean and Riemannian geometries. On edit: I'd also suggest you have a look at "rapidity" where it applies to the transforms, and in particular John Baez's treatment which points out the similarity between the (circular) trigonometric foreshortening equations for purely spatial rotations and the (hyperbolic) foreshortening equations for rotations involving the time axis. @Da Schneib as you might remember our discussion about 'time'. As I think I mentioned before my theoretical 'work' (I use that term loosely because I am a layman) about other 'time' having other dimensions but then I don't call these 'time'. However, don't want to rehash that, my point is that whatever alternative theories people might have they must, in the end, reflect what we experience and know today (mainly mainstream). If they don't, it's time to go back to the drawing board to find out why. But enough of that, my main reason for this comment, is that you mention John Baez's treatment & forsh. equs. I know very little about Dr.J.B. but do know he has done some interesting work on Octonions (I am currently using Quaternions). I'd be interested to read the point that you mention and wonder if you direct me. Have tried to find it but had no luck. Thanks in advance. Scroll down a page or two and you'll find a system of equations for t, x, y, and z that contain hyperbolic trigonometric functions like cosh and sinh. Less than a page below that (unless your display is very small) is the same set of equations but with ordinary trig functions. The first are the hyperbolic trig functions for calculating Lorentz transforms that include time; the second are the perfectly ordinary Galilean 3D rotation transforms. No one can look at these and read the surrounding material and not emerge with the conviction that velocity is rotation in the x-t, y-t, or z-t planes or some combination. Physicists have a name for this view of velocity; they call it rapidity. Let me know what you think, @Mimath, and this is the one I promised to look up, @dfj so you too. ......Physicists have a name for this view of velocity; they call it rapidity. Certainly the idea of rotation in S-T is really on one of unifying the dimensions into a 'continuum' and hyperbolic equations are some I have encountered that illustrate this. But as I say, JB takes a more modern Group theory approach therein I lack. You'll notice this passage early on. This, and other statements like it in the literature, represent the entities to which I am asking 'why'; thus to me 'time' has a more fundamental component but that component may not be legitimately be name 'time' but produces what we commonly call 'time'. Certainly makes no difference to mainstream theories but I've hit a couple of 'brick walls'(like ending up with S-T + 'something else') and until I can solve those problems my ideas are no more than scribbling...at least I know it eh? Ha! My point here is that reading that link you gave does make me see certain lacking on my part (Group theory) and urges me to correct it. So Thanks again. Ihave a look at "rapidity" where it applies to the transforms, and in particular John Baez's treatment which points out the similarity between the (circular) trigonometric foreshortening equations for purely spatial rotations and the (hyperbolic) foreshortening equations for rotations involving the time axis. Yeah. I'll have another go at that one of these days. On a lighter note I think Douglas Adams was on to something when in the last Hichthiker's Guide to the Galaxy books he introduced the concept of the (multiverse) being a WSOGMM ("Whole Sort Of General Mish Mash"). It may sound like he was larking around but the idea is that truly independent entities (not even space, time, etc.) exist...for the simple reason that if they did you could not relate them in any way to one another. But we know space and time are very rigidly related (though the speed of light). Of course the idea of everything being connected isn't new. It's as old as Buddhism, at least. More specifically: When we define stuff as being independent/orthogonal we should always be aware that this is only ever either a convenience definition or introduces unphysical concepts (or both) - and does not mirror reality. The map is not the territory. Wow..those 'papers' ...just... wow. One is all of ten lines long (and total BS). The other has a picture of rotten fruit as a show of time dilation. The third one is..seriously? "Fireworks get a shade brighter as they ascend into the sky"...that's an actual observation? I knew you were crazy...but what you 'wrote' there is stark raving insane. I was making fun of you ...but this I say with all sincerity and concern for your well-being: You really should seek professional help. Fast. Wow..those 'papers' ...just... wow. One...(and total BS). The other...rotten fruit as a show of time dilation. The third one is..seriously? "Fireworks...ascend into the sky"...that's an actual observation? I knew...but what you 'wrote' there is stark raving insane...say with all sincerity and concern for your well-being: You really should seek professional help. Fast. Harsh, eh? Anyone can make the mistake between averted vision and fireworks getting brighter as they get higher...candles 3 meters apart sure the top one looks brighter especially when it close to a white ceiling...we all know 'time' is a vector because because it has magnitude and direction...I mean it slows down when you're bored and speeds up when you're having fun but no matter where you are (or in what state) tomorrow comes around. Nah, no need to concern ourselves with 'time intervals' or good solid math....Ha Ha..good laugh though. Harsh, eh? Anyone can make the mistake between averted vision and fireworks getting brighter as they get higher...candles 3 meters apart sure the top one looks brighter especially when it close to a white ceiling.. Imagine: it's about dark matter and in every way it tries to find out what it is, what it looks like and what its characteristics are. But ignoring all this, some "shrewd inventors" say: they discovered a galaxy in which there is no dark matter. Who should immediately lead a psychiatrist, whether we believe in it or those who see this dark matter, and they do not even know what it is, nor have any indicators of it. It's a new type of science. Every one silly, who believes that there is dark matter, and no one can reveal it, he does not know what matter is in general, which is evidence, because science is not indifferent from what and how matter is formed. Science has become a corona coconut and in no way find grains of cereals.